Note! 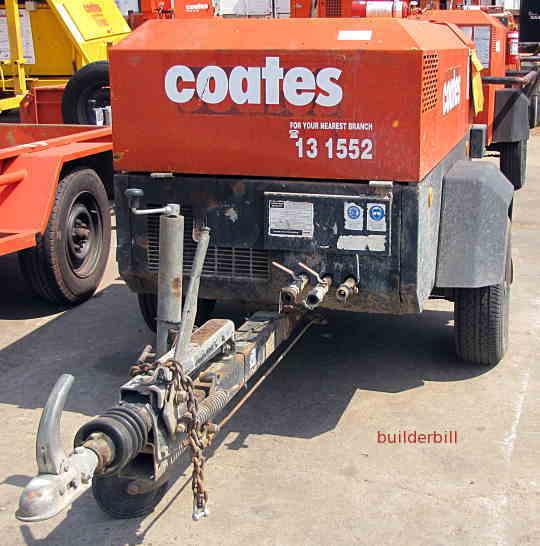 Apart from the photo above all the ones on this page are my own that I was kindly allowed to take at my local Coates hire depot. 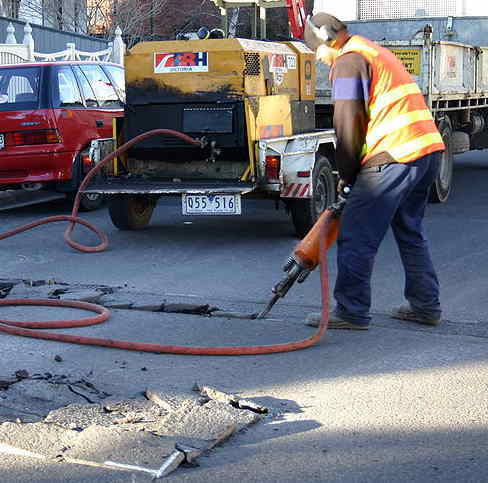 Another name for these tools is pavement breaker, and in the photo above (thanks to Wikipedia) is a guy doing just that. He is breaking up a road pavement. The tool in the breaker is a spade similar to the top tool underneath. Above are a few standard sized 1-1/4" breaker tools which refers to the distance across the opposite flats of the hexagon. Another standard size that brides the gap between air and electric is 1". These tools fit air breakers and also the larger electric breakers. This is a great saving in costs, being able to use the same tool in a number of different machines. Smaller sizes (usually for electric tools) start to have various manufacturer's propriety shanks and so are not standard although some makers have opted to use Kango shanks or adaptors can be bought. A chisel point. Used for most rock and to a certain extent weak concrete. A smaller spade or clay spade. 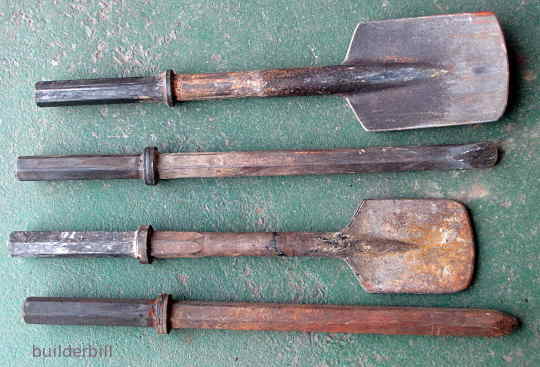 Quite often clay spades are curved and they are used in firm ground and clay. Moil Point. The name of a stonemason's hand tool with a same shape, the moil point is for when the going gets tough. For breaking hard rock and concrete. A 75lb (probably the maximum legal size allowed by "work health" OHSA etc. This size of breaker uses typically 80 to 90 cubic feet per minute (cfm) at 90 pounds per square inch (psi). 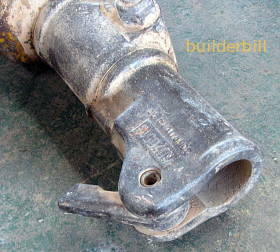 The claw coupling is a standard way of joining hoses and tools. On the breaker itself it can swivel to any angle, until the air pressure is on when it becomes fixed. The yellow plastic jacket around the body of the jack hammer is a silencer. The way of fitting and securing the tool into the breaker is by opening and then closing this lever which has a cam on the inside. The lever has to be fully open to insert the tool, and then brought back to fully closed to secure it. Quite often, what with mud and dust these levers need a bit of persuasion to open them and a hand hammer is often used. You may have noticed the rather inadequate 6' x 4' box trailer carrying the air compressor in the top photo. The photo here is what the modern safety conscious contractor uses in the way of a mobile air compressor. Note the override brake and hand brake.